Yesterday, Facebook reminded me that it's been one year since I painted the craft room. Wow! We've been here just over a year. From the start, I had hoped to share with you the changes we've made. However, I really haven't done a very good of a job of that. Oops! 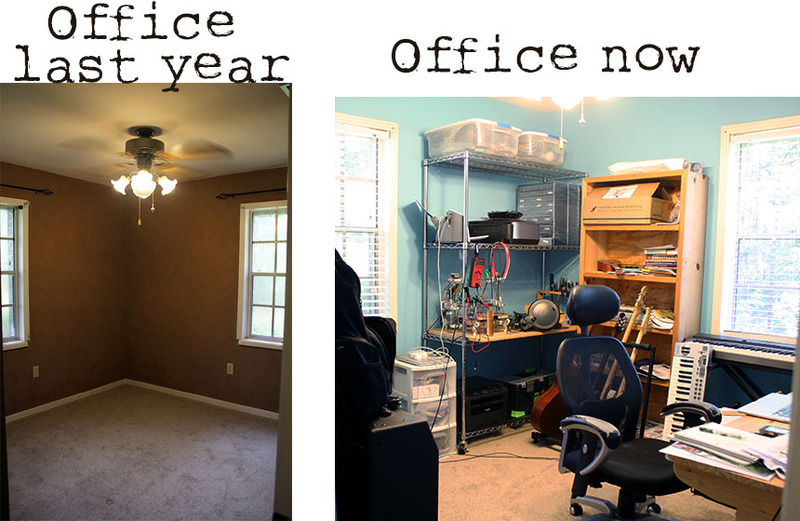 In reality, it doesn't even look like we've done all that much, but I assure you we have worked our butts off. Since we've hit the one year mark, I suppose it's time to show you where we're at now. Let's start like we did last time, with what you see when you walk in the door. 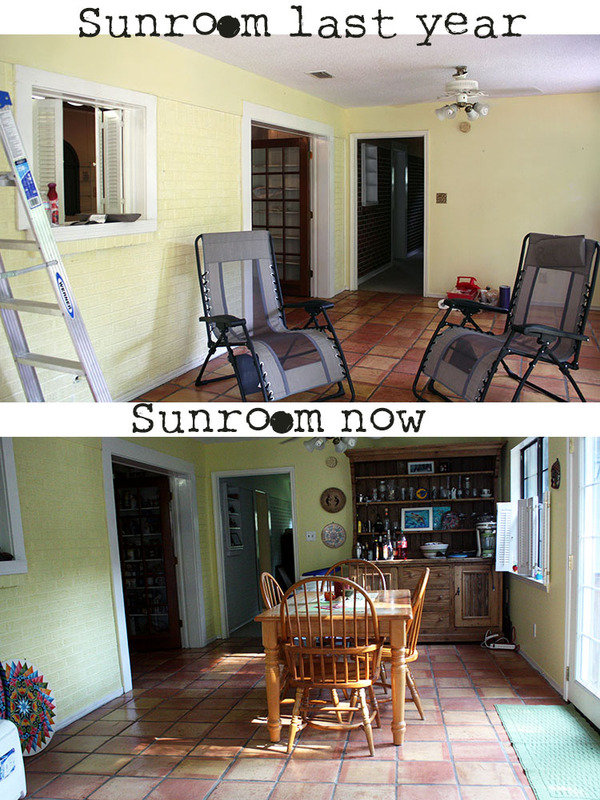 Besides the addition of real furniture, we painted the room a slightly deeper shade of yellow. 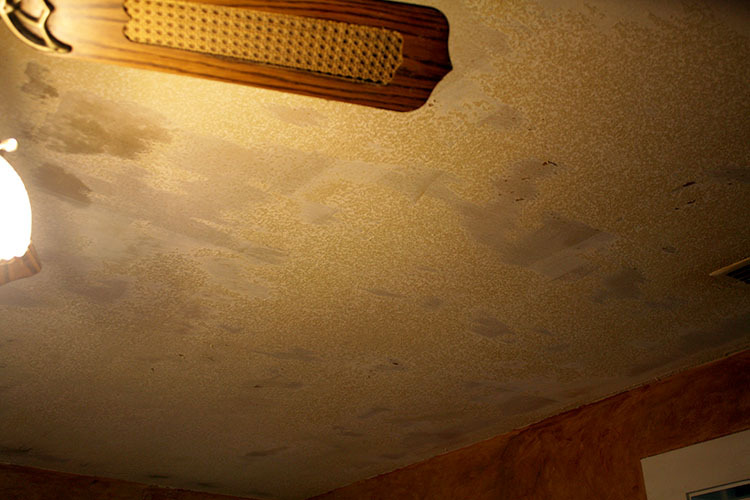 We tried scraping the popcorn ceiling, but it's absolutely cured on there. We're going to panel it eventually anyway so not much has changed. From the sunroom, you can walk right into our bedroom. 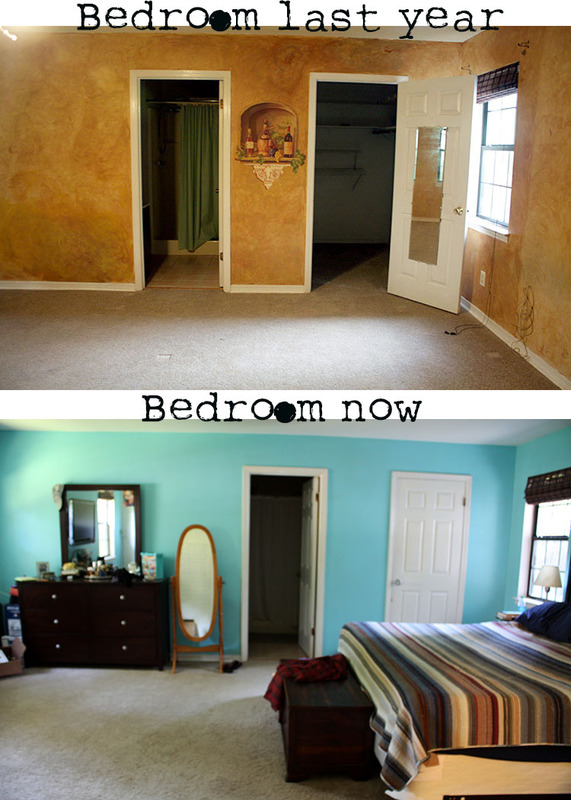 This is the room that has seen the most drastic changes so I've got quite a few pictures to share. From this angle, you can see the bulk of the renovations: walls painted, ceiling scraped and painted, and light fixture/fan changed. The fake shelf is now gone. It had to be sanded off. And, the blue is more more soothing and more our style than the previous wall treatment. The red brick just didn't go well with the blue paint. The white is so much better. 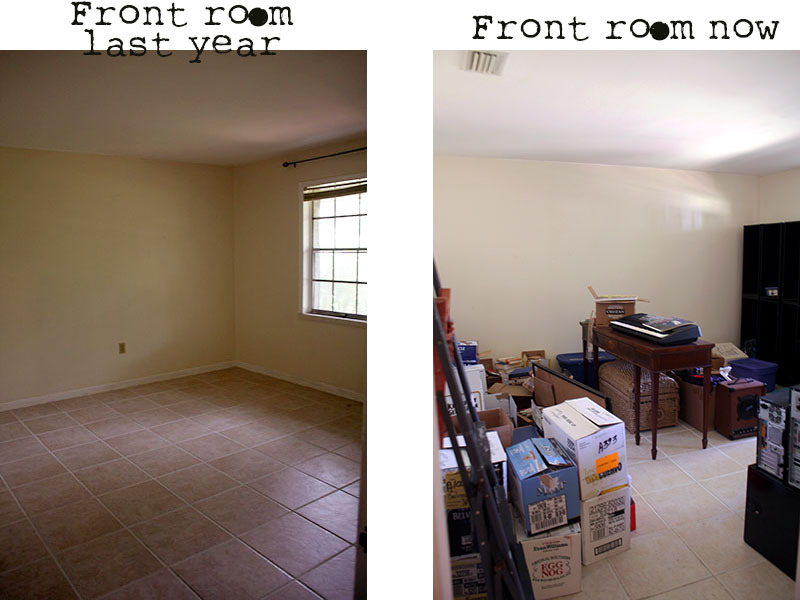 Here are some pictures from the 'during' process of this room. 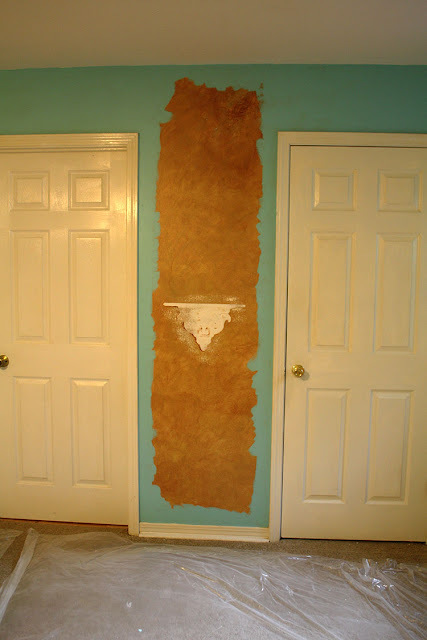 Scraping the ceiling was a seriously difficult task. We had a hard time removing all of it. However, the flat paint we put over it takes away from it some. Now it just looks like we have a slightly textured ceiling. This brick wall used to be the original exterior of the house. 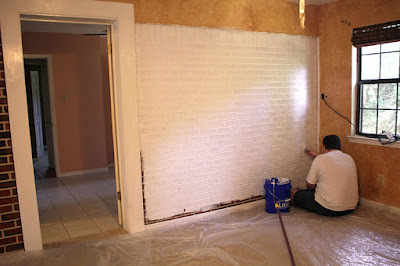 Painting brick is also no easy task, getting into all those nooks and crannies is a real pain! While all that work went into the bedroom, there are still a few decorative things to be done. However, it's still the most complete room in the house. 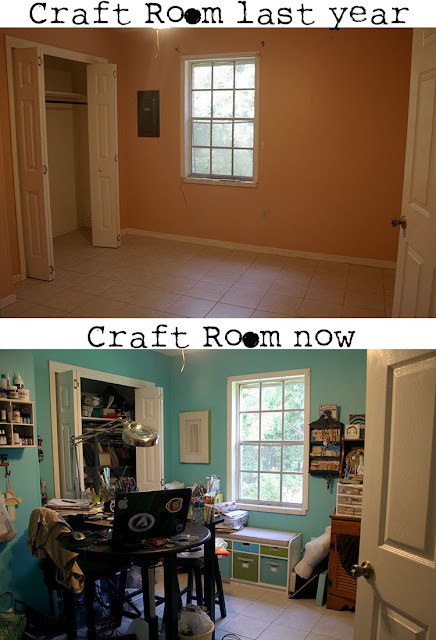 From the bedroom, you can walk right into my Craft Room. 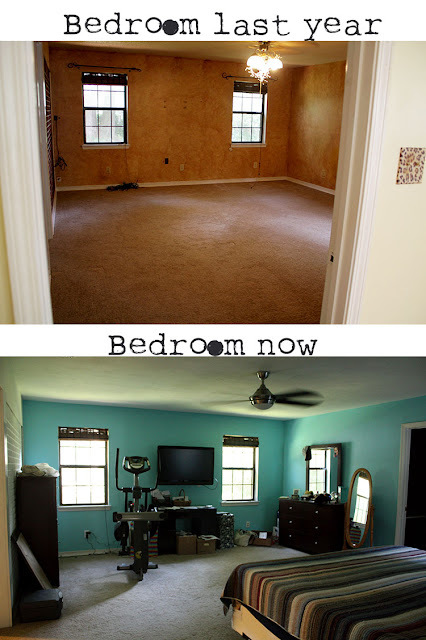 It looks so much bigger in the before picture. Alas, it is a tiny room. Hence, the DISASTER! One day I'll get it all organized and pretty, but for now I just want it to be functional. It's loaded down with so much stuff but not all of it. Our front room. . .formal living room. . .foyer room - whatever that room is, we call it the box room because of this. Everything we haven't unpacked and everything we don't have a place for and everything we're not sure we want to keep is in this room. Fortunately, we don't use the front door so this room is kinda out of sight and out of mind. It's mostly books and knick-knacks. . .mostly. The last room with some real change to it is the living room. Like the bedroom, there are still a few decorating things to be done (like add a rug, change the overhead light/fan, and add some other lighting). The gray walls are an upgrade to the weird peacy-tan ones. For the most part we are happy with this room, especially since we added the new couch. 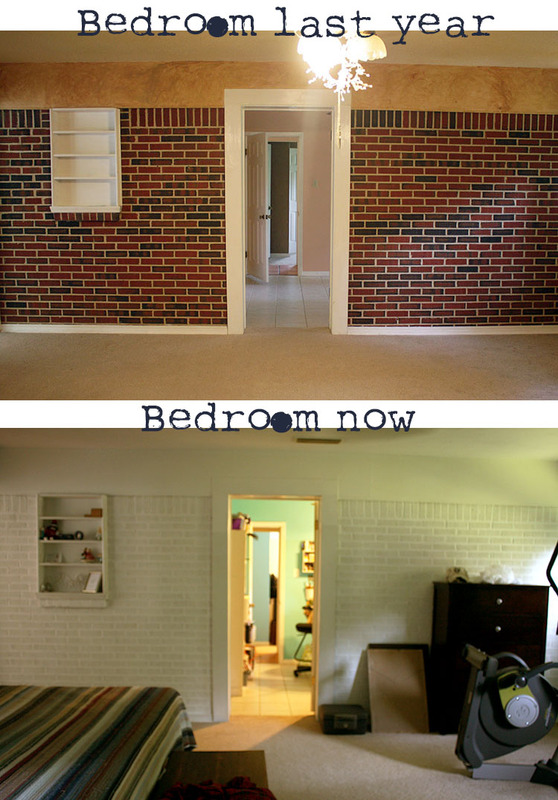 One of the main things I still want done at the house is to take out the large wall above. There's a wall in the kitchen that needs to go too. 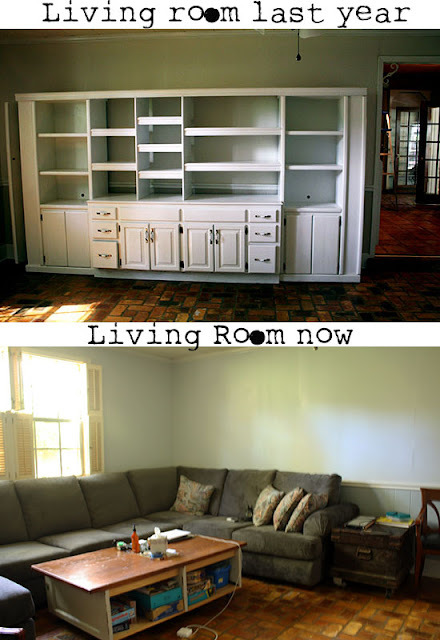 Opening up those two walls will make the living room, kitchen, and front room one large room. Oh, and the wall unit in the first picture above is the same one we used to make our custom TV stand. I didn't show you any of the bathrooms, the guest room, or the kitchen because we haven't started in earnest on any of them. Of course, I'm anxious to tackle it all, but need to try to exert some patience for our sanity as well as our pocketbook. I could show you pictures of the pool and property as well. But, in looking back at the pictures I shared in October - not much has changed. . .at least, not much that anyone else but us would notice. In fact, we've spent the majority of our time and money working on outside projects. We've had a few trees taken down. We replaced the roofs on the two main out-buildings. And, we've cleared out some of the overgrowth and trash on the property. But, in pictures, it looks a lot like it did last year. Both inside and out there's a ton of more improvements and changes to be made. 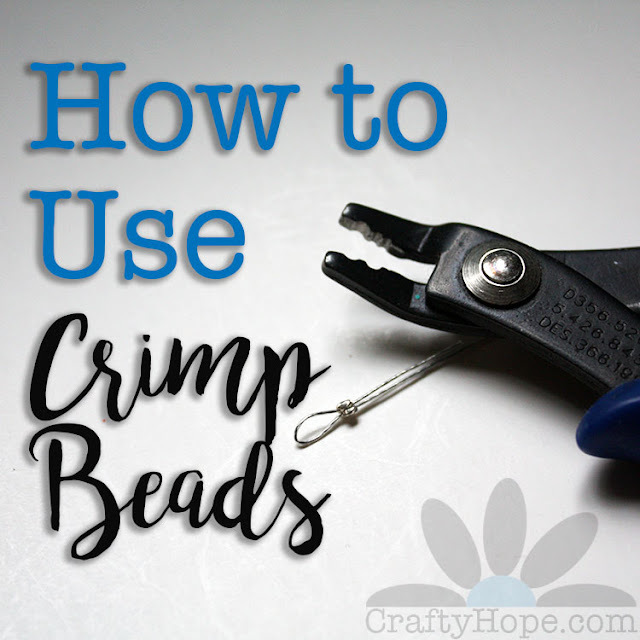 I try to remind myself that it will take time and money to get these tasks done. And, since this is our 'forever home', we've got the time. Now to figure out the rest. Anyway, that's the bulk of it. Pat and I are actually hoping to start filming some of the improvements and projects we have going on around here before too long. I'll let you know when that all goes down. For now, we'll just keep chugging along. Thanks for all the questions, support, and interest we've had in the place since we moved. We are indeed loving it out here. And, I'll try to do better about sharing the changes. If y'all are still interested. . . I (we) notice all of the outdoor changes! :) Ands, of course, the indoor changes too. Wow! Wow! You have worked very hard and it shows. All that work took a lot of time and energy! Pat yourself on the back and be pleased. You deserve it.Looks very nice. Wow. You did a lot of work. It all looks great. I'm so happy that you found the perfect place to settle in and that sure did seem like a fast year! 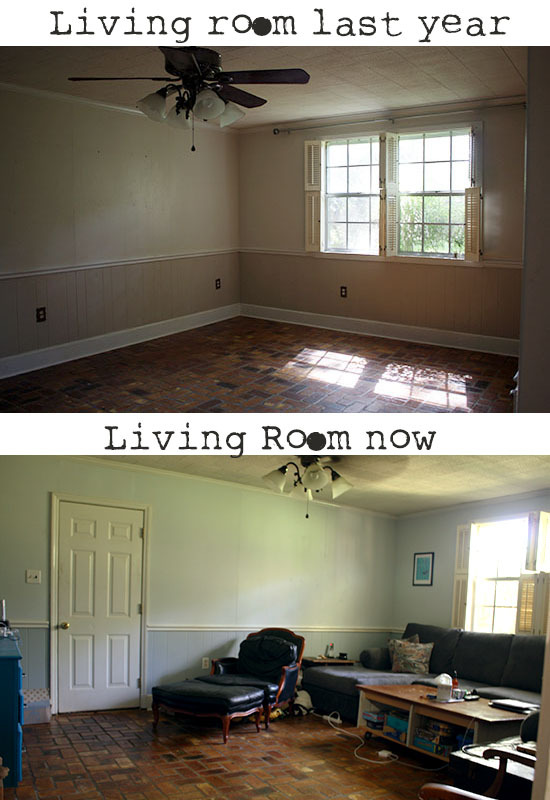 I really love that sun room with the tile floor and that big sideboard. It looks wonderful, Hope! Great job! I appreciate you popping in! wow, my muscles are aching just thinking about all that work! I love the white painted brick and your bright sunroom-- it's fun to look back and amaze yourself with all you've done!! 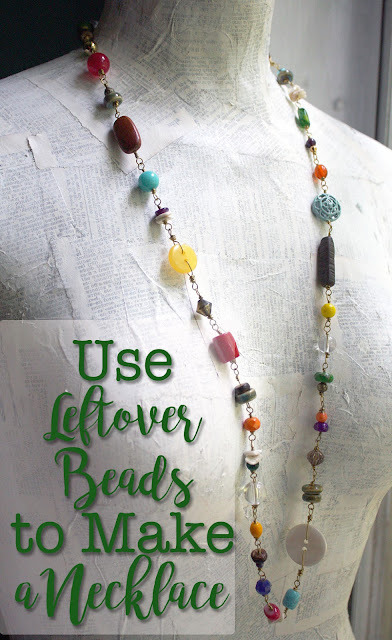 Luckily you are both so creative and handy! You have done an amazing amount of work. Your home is lovely and comfy. Thank you Kathy! Comfy and cozy are definitely what we're going for here. And, while I know it's crazy that's there still SO MUCH left undone, I know we'll get to it eventually. My books can't stay in boxes forever! Thanks for taking a peek.